Referring to the portion of PM Modi's interview with ANI regarding the controversial deal, the opposition leader said that the Prime Minister spoke for one and a half hour but did not answer fundamental questions about Rafale. Congress president Rahul Gandhi targeted Prime Minister Narendra Modi over the alleged discrepancies in the deal for 36 Rafale fighter jets during his speech at the Lok Sabha on Wednesday. Referring to the portion of PM Modi's interview with ANI regarding the controversial deal, the opposition leader said that the Prime Minister spoke for one and a half hour but did not answer fundamental questions about Rafale. Gandhi raised questions about the process, pricing and alleged patronage in procuring 36 Rafale jets from Dassault Aviation. Rahul even asked permission to the play the audio tape allegedly quoting a Goa minister saying that the former Defence Minister Manohar Parrikar had the files related to the Rafale deal 'in his bedroom', but the plea was denied by Speaker Sumitra Mahajan following objection from Finance Minister Arun Jaitley. 03:50 pm: A JPC against the Supreme Court order cannot be formed, Jaitley said. 03:40 pm: The prices of basic and weaponised aircraft negotiated by us is lower than that in the UPA era, Jaitley said. The prices also came with an escalation clause, he added. 03:36 pm: The Supreme Court has said that it has examined the process for purchasing Rafale jets and is satisfied with it, Jaitley said. 03:35 pm: After the meeting between PM Modi and President Hollande, the press statements mentioned that the Rafale jets will be brought under a better procedure than what was followed during the UPA regime. 03:16 pm: Arun Jaitley raised the statements made by Christian Michel, alleged middleman in AgustaWestaland scam, during his interrogation which refers to Sonia Gandhi and Rahul Gandhi. Consipirators of various defence deals have the audacity to make allegations against other, Jaitley said. 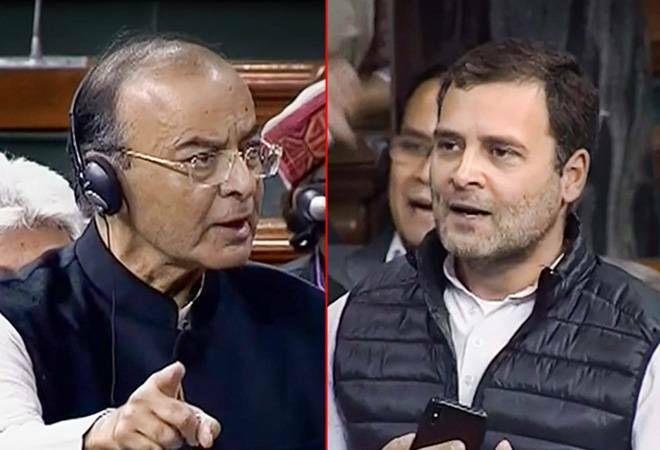 03:06 pm: Everything he has said is belied in the face of the Supreme Court judgement, Finance Minister Arun Jatiley said in his response to Rahul Gandhi's speech on Rafale deal. 03:00 pm: We demand a JPC probe in this matter, Rahul Gandhi says as uproar over his claims calms a little. 02:41 pm: "He (Rahul Gandhi) wants to rely on a tape that is false and fabricated. Let him authenticate it, place it on the table of the House and open himself for an action of priviledge," Finance Minister Arun Jaitley said in his objection to playing the audio tape related to Rafale deal which surfaced today. He must take responsibility, and face explusion from the House under a priviledge motion is the tape is found to be false. 02:40 pm: Rahul Gandhi seeks permission to play the audio clip allegdly quoting a Goa health minister implicating Goa CM Manohar Parrikar to keeping the files related to the Rafale deal 'in his bedroom'. Finance Minister Arun Jaitley objects to the plea, following which it is turned down by the Speaker Sumitra Mahajan. 02:37 pm: There are a number of holes in the Rafale story, Gandhi said. The Prime Minister does not have the guts to come to the Parliament and face the questions, he further added. 02:36 pm: Why did you take away this deal from HAL and gave it to Anil Ambani, Gandhi said. 02:34 pm: Why did the price go from Rs 526 crore to Rs 1,600 crore, Rahul Gandhi said. He also reiterated his questions over taking the deal from HAL and handing it to Anil Ambani-led Reliance Defence. 02:32 pm: The Defence Minister Manohar Parrikar was asked whether he knew about the new deal that bypassed the old deal. He himself said I have no idea about the new deal, said Rahul Gandhi. 02:30 pm: The excuse given in procuring only 36 aircraft that we needed the aircraft urgently. I would like to ask, if you needed the aircraft urgently, then why not a single Rafale aircraft has landed on India soil until today, Gandhi asked. 02:25 pm: Who changed the requirement of the Air Force from 126 (Rafale jets) to 36? Did something changed with the requirement of national security? Did the Air Force tell the government that we do not want 126 planes, we want only 36 planes? 02:15 pm: The questions of Rafale occur on three pillars. The first pillar is the process with regards to the deal. The second pillar is the pricing. And the third and the most interesting pillar is paisa, patronage, Gandhi said. 02:13 pm: He (PM Modi) spoke for almost one and a half hours... but did not answer the fundamental questions about Rafale, Rahul Gandhi said. 02:10 pm: It is a tragedy that the member of AIADMK are doing a service to the BJP by withholding this debate, Congress leader Rahul Gandhi said as AIADMK MPs continued raising slogans.